Stained glass windows at Riverside Church are in the tradition of Chartres Cathedral in France and made in the U.S. and France. 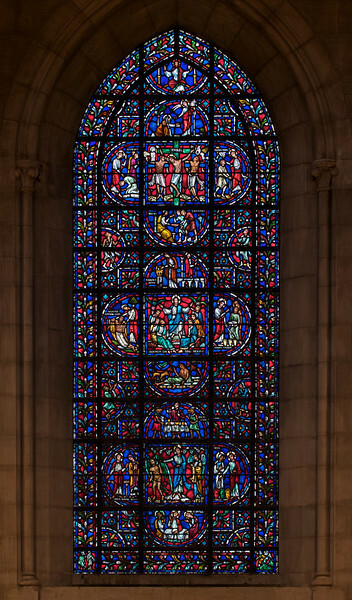 Many subjects of the aisle windows relate directly to modern history, such as the Declaration of Independence and the Emancipation Proclamation, treated in the Gothic spirit. Other windows celebrate the accomplishments of Aristotle, Socrates, John Calvin, and Roger Williams. I haven’t been able to find the names of the artists that created the windows. There are ten aisle windows with the west aisle windows representing the following themes: Agriculture, Reformers, Bible, State, and Builders with the east windows representing International, Humanity, Scholars, Music, and Children. The aisle clerestory windows (upper windows) symbolize the communication of God with humanity through Jesus Christ, according to the church publication I referenced in the first photo.